Well, that was fun! The first-ever Run of Play contest has run its course, and for a blog competition that wasn’t even organized around the publication of a vaguely cynical tie-in book (next time, guys) I think we did pretty well. You wanted to choose the player for tomorrow’s portrait, and you fought for the right, and now, thanks to the internet’s instantiation of a world of transcendent meritocracy (*waves*), one of you has objectively won it. The challenge, in case you’re just now tuning in, was to describe Peter Crouch in one line. Here were some of the entries I liked that didn’t quite make the top three. A. suggested that Peter Crouch “looks like a mutant praying mantis…plays like one too.” This one was rejected for being too accurate. Peter Crouch looks so much like a mutant praying mantis that it’s almost not even a metaphor. Em wrote that Peter Crouch “is the crisis point between earth and sky.” I liked the poetic evocativeness of this description and the fact that it could have been an allusion to some Greek drama that I never got around to reading. But I think Peter Crouch is actually warming the bench for the Crisis Point Between Earth and Sky XI, behind Emile Heskey and David Beckham’s thirty-foot-tall innermost sense of himself. The magnificently named Feilhaber23 called Crouch “the Jonathan Livingston Seagull of mop handles.” This was disqualified for being entered after the deadline, and also because I prefer Richard Bach’s unjustly neglected novels about ferrets, which are finally, finally being made available for the Amazon Kindle. Third Place — Goes to Dan for “He runs like a slinky that’s bent in the middle.” I can’t even tell you in what ineffable way this captures the essence of Peter Crouch—maybe because a certain mesmerizing goofiness is common to both Crouch and the toy that everyone knows is Slinky. Or maybe because, if you let your eyes go a little out of focus, it’s easy to imagine that Crouch is running on springs whose coils have gone a little out of whack. Second Place — Goes to Ursus Arctos for “The greatest striker to ever come out of the Land of Misfit Toys.” Because yes, of course, where else could he possibly have come from? First Place — Goes to Henry for “A game of pick-up sticks in triple time.” Because I can’t think of a better analogy for the way Crouch seems to compile and decompile and point himself in all sorts of akimbo angles terminating in tiny sharp stabs and needles than this line about a sped-up game of pick-up sticks. By my estimate it’s more like sextuple time, but then my approach to pick-up sticks, like the dark side of Avram Grant, has always been deliberative and calculating. In any case, Henry, congratulations, and here’s your cloudburst of glory. We’ll be in touch about your grand prize soon enough. Try not to choose Denny Landzaat, okay? It’s worth noting that all three of the winning entries described Peter Crouch as a broken, sped-up, or eccentric children’s toy. I’m going to assume that this comparison captures something deep in Peter Crouch’s nature, and not that I have a soul made up of Saturday-morning television commercials that I saw when I was seven and can’t break away from now because the remote control is over by the bookcase. Troppo gentile, as we say in Italy. Not only a very worthy winner, but a third place entry that was better than mine. Though I am beginning to find your collection of stock photos just the slightest bit troubling, Brian. 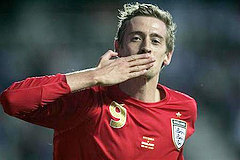 What did it, Ursus, the 34th picture of Peter Crouch this week or the cloudburst of spiritual glory? If it’s the former, rest assured, Crouch is going into deep freeze around here for a while. If it’s the latter, what can I say? I belong to Jesus. Hey, thanks!! I’m glad to be a part of the children’s-toy consensus. And I think we need a Tuesday Portrait of a keeper. Oh man, I would have had the hardest time deciding between Ursus and Henry’s submissions. I’m glad my cautious decision not to enter this competition (given my obvious lack of literary flair) paid off, as I got to sit back and enjoy nothing but outstanding entries. Bravo, all. My thoughts echo those of Tom. You are all poets of the highest order. Just wanted to add that I don’t find the cloudburst of glory stock photo troubling at all. Not even a little, Henry? Wow. I feel like I’ve failed. Henry clearly has a higher troubling point than I do. I think it was the combination of that and the Holy Spirit cupola that did it for me.